The lecture for 1997 is given by Sidney H. Griffith, ST. Fr. Griffith was born in 1938 in Gaithersburg, Maryland. After attending the Holy Trinity Mission Seminary, in Winchester, Virginia, he was ordained a priest (Missionary Servant of the Most Holy Trinity) in 1965. Fr. 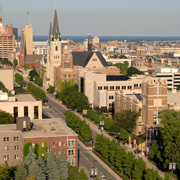 Griffith went on to receive his Licentiate in Theology from The Catholic University of America (CUA), in 1967; he received his PhD, in the area of Syriac and Mediæval Arabic, from CUA’s Department of Semitic and Oriental Languages and Literatures in 1977. Fr. Griffith has taught at CUA since 1977; since 1984, he has been the director of CUA’s Graduate Program in Early Christian Studies. Fr. Griffith has been a fellow at the Institute for Advanced Studies, The Hebrew University of Jerusalem, as well as at the Dumbarton Oaks Center for Byzantine Studies. He has been president of both the Byzantine Studies Conference and the North American Patristic Society. Since 1986, Fr. Griffith has served as a member of the Catholic Delegation to the Eastern Orthodox/Roman Catholic Consultation. Fr. 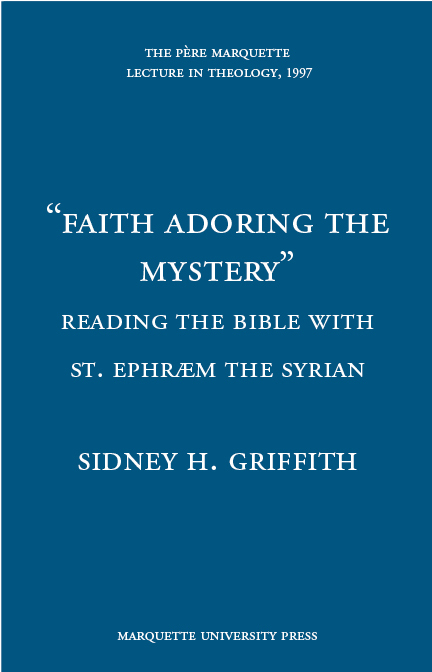 Griffith has published numerous works in the areas of Syriac Christianity and Christian Arabic. Scholarly interest in the Syriac-speaking Christianity of early Byzantine Syria and Sassanid Persia, aside from Biblical studies and the occasional intrepid explorer, is a relatively new phenomenon. There is the pioneering work of Arthur Voeoebus and Dom Edmund Beck in the 1940s, 50s, and 60s, but it is really with people such as Robert Murray and Sebastian Brock from the 1970s onward that excitement and interest began steadily to mount. Today the area is well on its way toward becoming the major field of patristic research, alongside of, and increasingly equal to the long-plowed acreage of the Greek and Latin Fathers. Why this excitement? Three reasons should suffice. First, Syriac is a dialect of Aramaic, and Syriac Christianity thus represents a continuous Christian tradition whose idiom was governed by essentially the same language as was spoken by those fishermen, peasants, and tax collectors who gathered to hear the Lord Jesus preach in Roman Palestine, and who then went on to spread the new faith of the Messiah along the great trade routes of the Roman Orient. As a result, second, in the writings of an Ephrem Syrus (=373) or of an Aphrahat the Persian (fl. 340s), to name but two, readers discover themselves in touch with currents of Christian and pre-Christian, Jewish though that extend back into the Palestine of the first century AD and before. These currents, third, serve not only to shed light from new angles on Christian origins, including the books of the New Testament, but also on well known Greek and Latin Christian writers of the early centuries, and so on the formation of classic Christian doctrine, spirituality, and liturgy. It is, for example, now rightly felt to be impossible to account for Byzantine hymnology and monastic literature without recourse to Syrian Christian poetry and ascetic writings. To be sure, Syriac Christianity has an intrinsic value and appeal, a lyrical, poetic approach to theology which can appeal directly to the directly to the modern reader, but these ancient kinfolk of the better known world of the Western churches, Greek and Latin, also tell us valuable things about ourselves, about our own tradition(s), and the continuity of Christian experience. They reveal new facets, new ways of looking at ideas and customs that we had long thought perfectly familiar and thoroughly explained.